For Disney fans out there I want you to think about Beauty and the Beast and that wonderful scene when they ask Belle to “Be Our Guest”. I had been singing this song in my head for the past few days since receiving an email from the team at Petite Mort asking if I would like to be their guest for dinner. “Be our guest! Be our guest! Of course I’d like to be their guest! And I was able to bring a friend! So I asked GG to be my friend and thankfully he said yes 🙂 So we were all booked in for a highly anticipated return visit to Petite Mort! 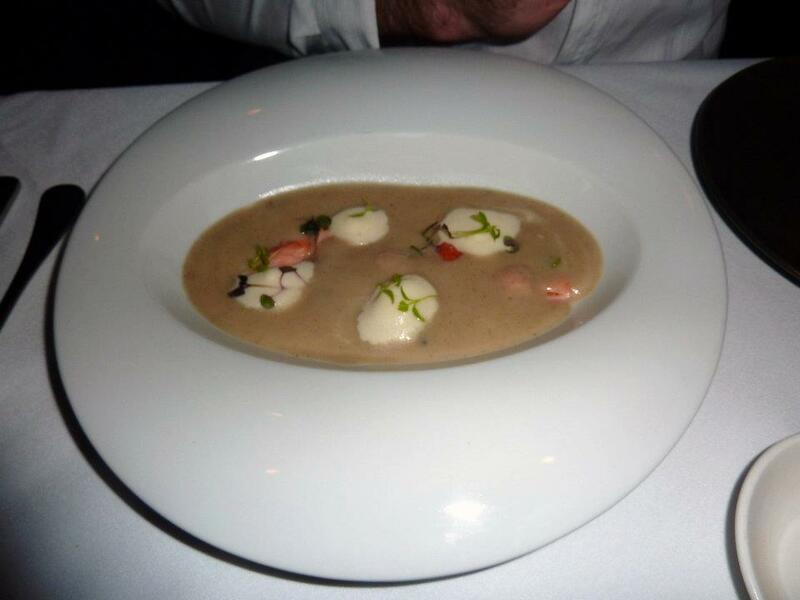 We were so excited, what a mid-week fine dining treat it was sure to be. We arrived and were shown to our table by a super friendly waitress. There was a decent crowd when we were seated at 7.30pm. Would you believe I actually knew the fellow at the table next to us! What are the chances? And as I sat back and looked across the restaurant I spied Perth’s premier food critic at the table opposite ours – the bespectacled Rod Broadfield….. ooo la la! I wondered how his meal was going. I like the way the run their menu at Petite Mort. It’s small plates, but they aren’t designed to be shared. 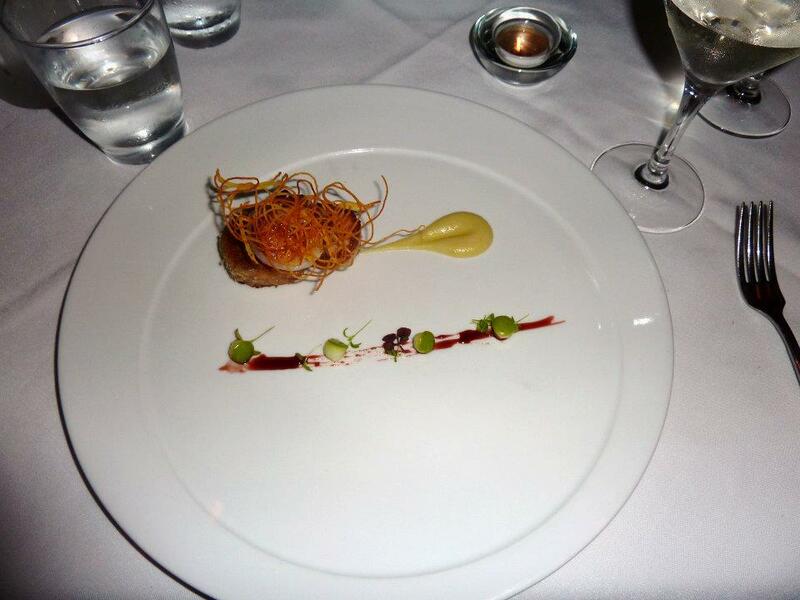 Essentially you are structuring your own degustation dinner. So we both began perusing the menu and decided we’d each select 4 courses to begin with and we were assured that we should be suitably sated with this amount of food. So, what to have, what to have? There were so many tempting options available, including a few of the choice items we’d had on our last visit, but we both decided we’d aim to try new dishes. As it turned out there was only one cross over in what we went for. 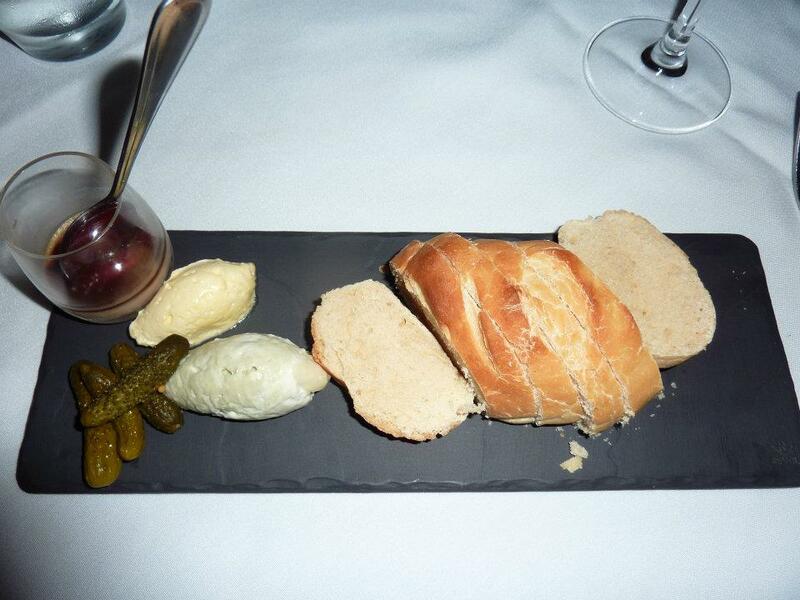 I started with the Petite Mort’s Ploughman – Home Made Sourdough Bread, Whipped Butter, Blue Cheese Chantilly, Cornichons, Duck Liver Parfait with White Pepper and Port Jelly. It was beautifully presented with an abundance of bread. GG found my choice slightly peculiar, given that I’m not the biggest fan of duck liver parfait, but it was actually really nice and I am a huge blue cheese fan and having it whipped into a light fluffy Chantilly was just divine! Whipped butter, whipped cheese – it was so light and creamy and a great start to the meal. Across the table, GG had gone for one of the new additions to the menu, the Jerusalem Artichoke Soup, House Smoked Salmon, Horseradish Foam. Against, wonderful presentation, with the salmon and a few greens artistically displayed and then the soup dramatically poured into your bowl at the table. I like a bit of drama with dinner. 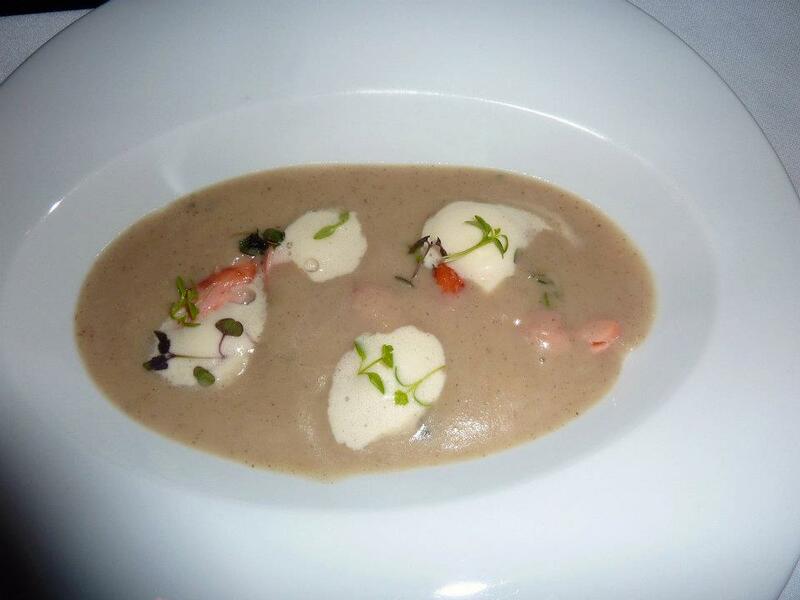 I was lucky enough to try a spoonful of this soup, both by itself and then with some salmon and it really was amazing. Ideal for the wintery weather and just so full of flavour. Next up was where two worlds collided and we both ordered the Seared Scallop, Pig’s Head, Apple ($17). 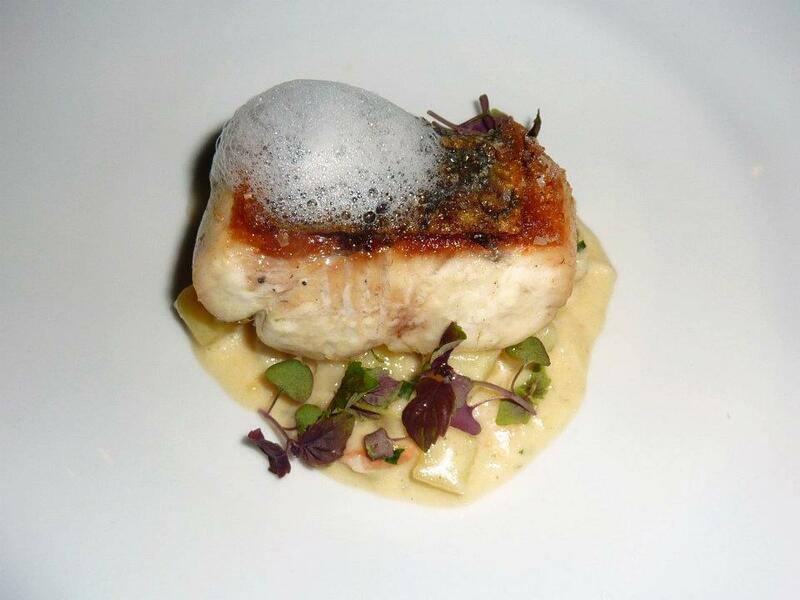 This, we were told, was Chef Todd Stuart’s signature dish. GG had ducked to the bathroom at this point so I took the opportunity to find out a little more about how this dish was made. Apparently boxes of full pig heads arrived, which did strike me as a little macabre, but hey such is life in a kitchen I suppose 🙂 And these are then cooked for a good 12 hours and then little circles of meat are taken from the head. I suppose a lot of it would come from the cheek. They seem like a good meaty spot. So anyways, these meat parcels are coated in a bread crumbs and fried, then teamed with a scallop and a little apple sauce and voila, the plate is ready. 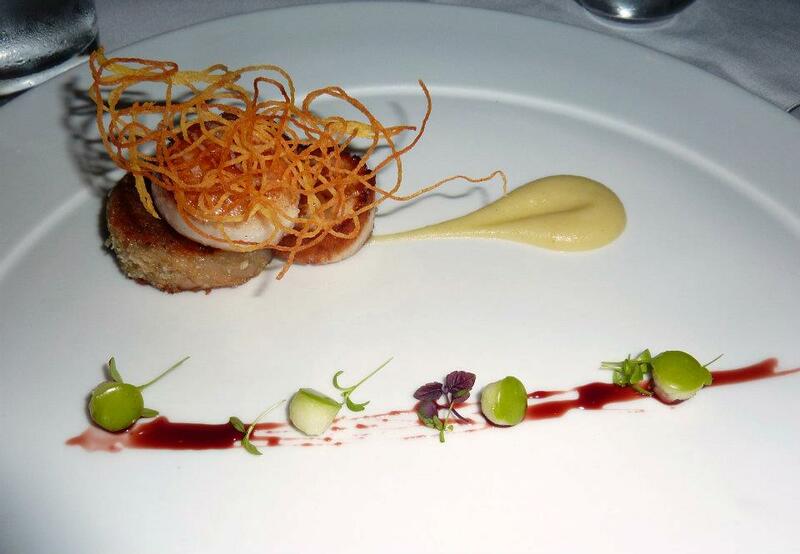 The combination of the pork with the scallop was just a match made in heaven. The sweetness of both meats, further enhanced by the apple…. Ahhh happy sighs all round. This was a total winner! Next for me was the Saffron Gnocchi, Salsa Verde, Parmesan, Tomato ($16). 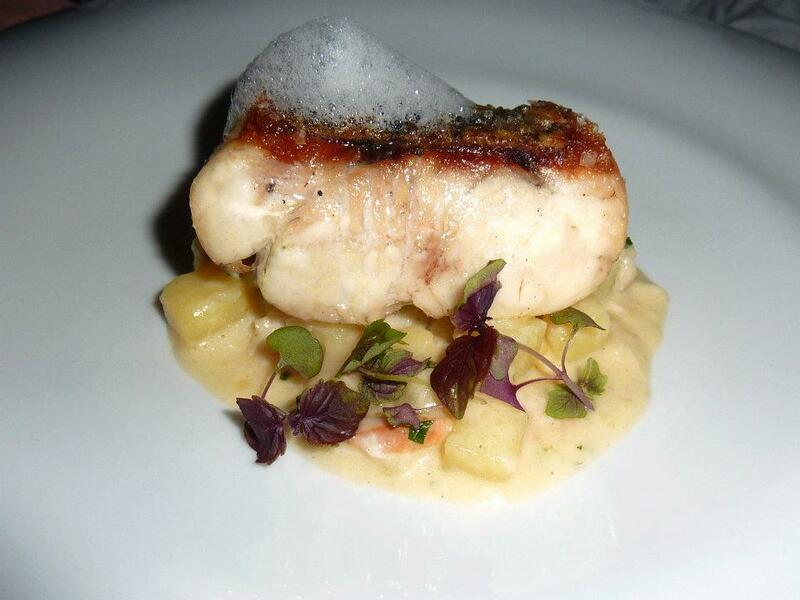 I love gnocchi and I’m always keen to see how these high end places prepare it. I thought this dish was just a vision. 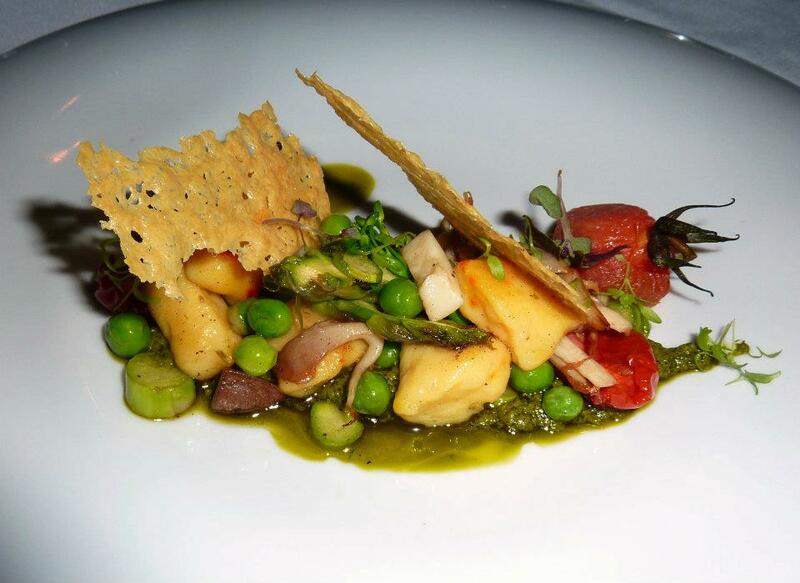 The colourful combination of vegetables, the creative crisps of the parmesan and the delicate gnocchi parcels. A little of each on your fork and you were set. Deliciousness in every bite and the gnocchi was sooooo soft and fluffy! Wonderful stuff. 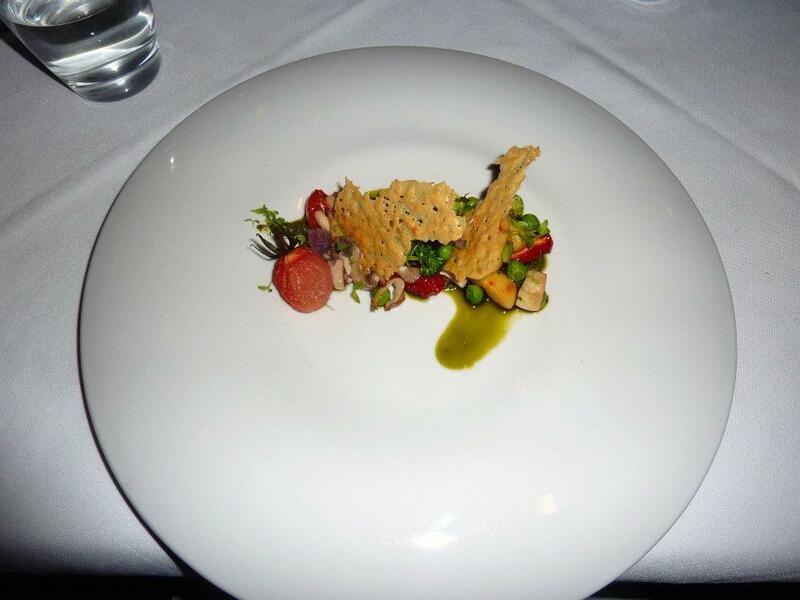 Before our final savoury courses arrived we were presented with a palate cleanser, which looked very elegant in its tall glass. 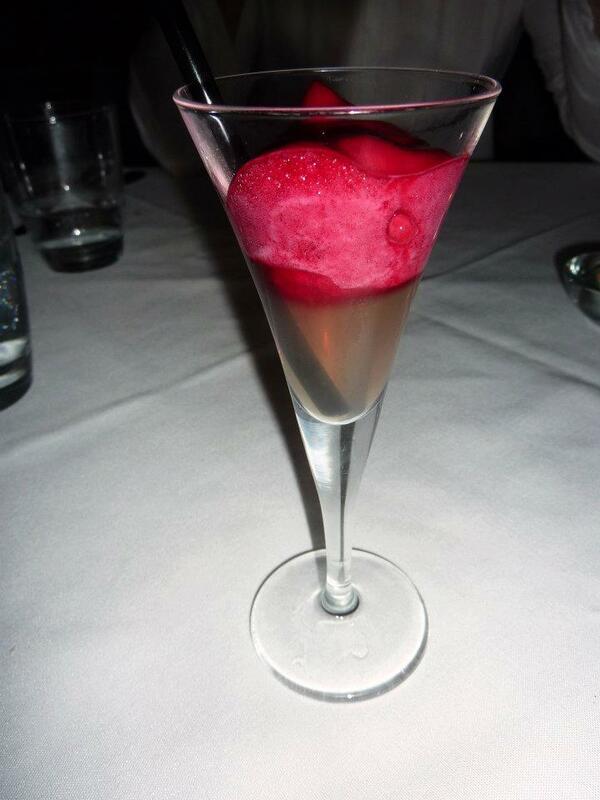 It was ginger water with a beetroot puree and it was soooo nice! They should sell bottles of that ginger water by itself. It had this wonderful refreshing spiciness to it. 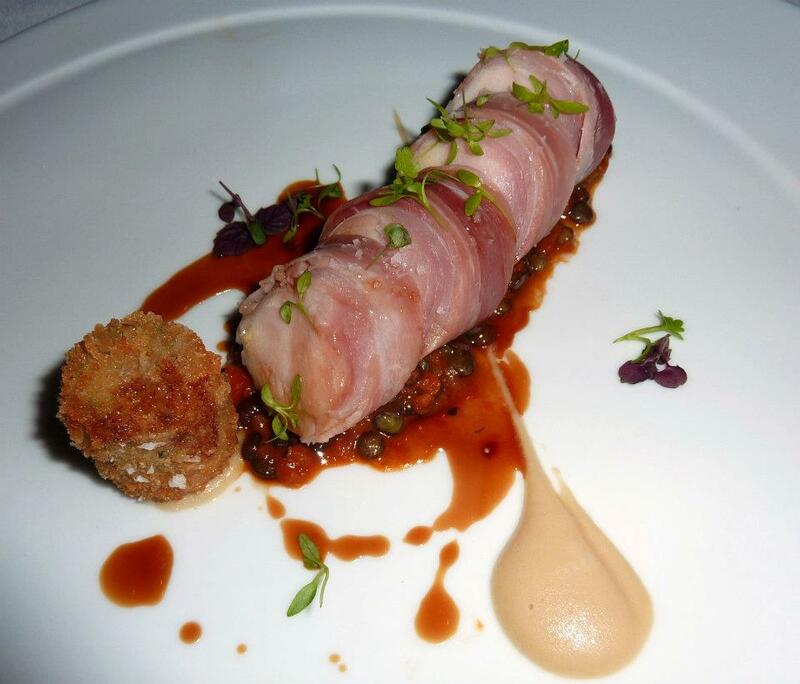 So moving on from there, I decided I would try the Rabbit Loin and croquette, White bean, puy lentils ($26). Again, I can’t fault the plating arrangement, but I did find the prosciutto just a touch on the salty side. Granted prosciutto is a very salty meat and I’m very pro-salt, but it was probably just a tad too much for me. 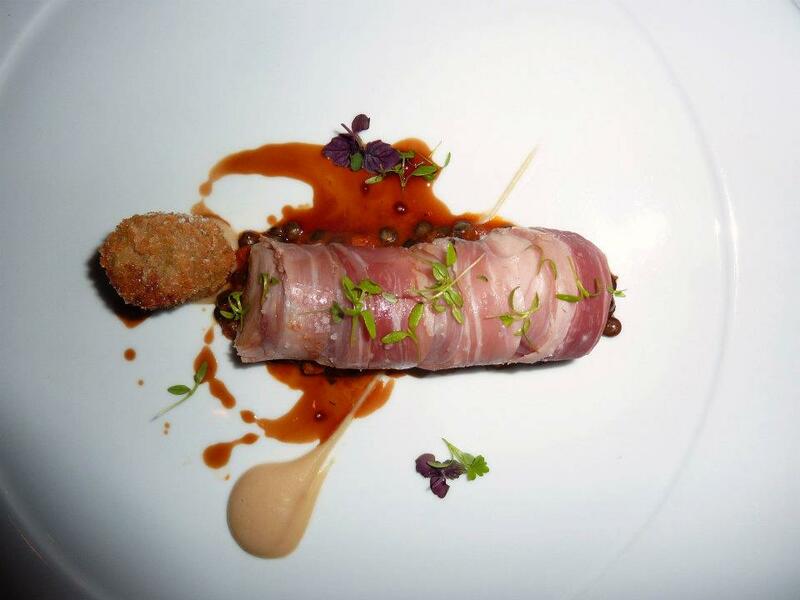 Having said that when I had a bite of the proscuitto wrapped rabbit along with some of the puy lentils, the combination was a lot more pleasing. I really enjoyed the flavouring of the lentils, which I believe were done in a red wine reduction, it was very rich and tasty. 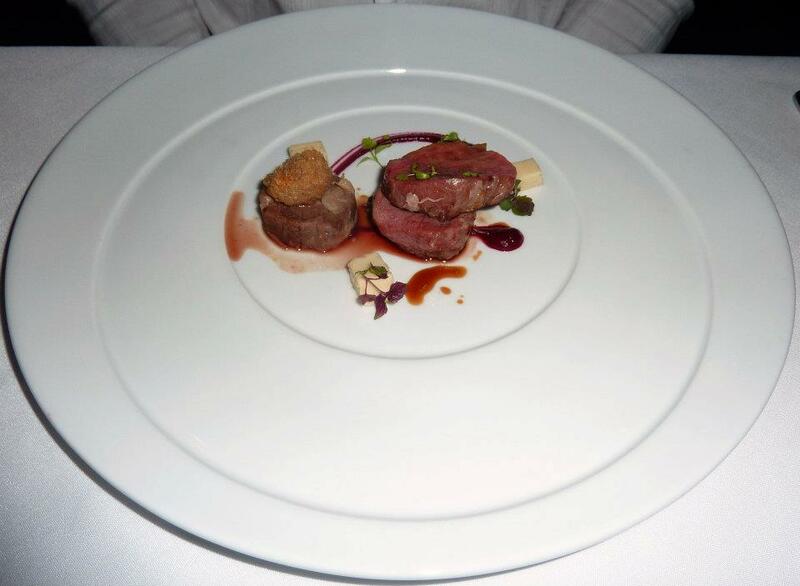 GG’s finished with the Beef Flank, Ox Tail, Marrow, Horseradish, Beetroot ($26). 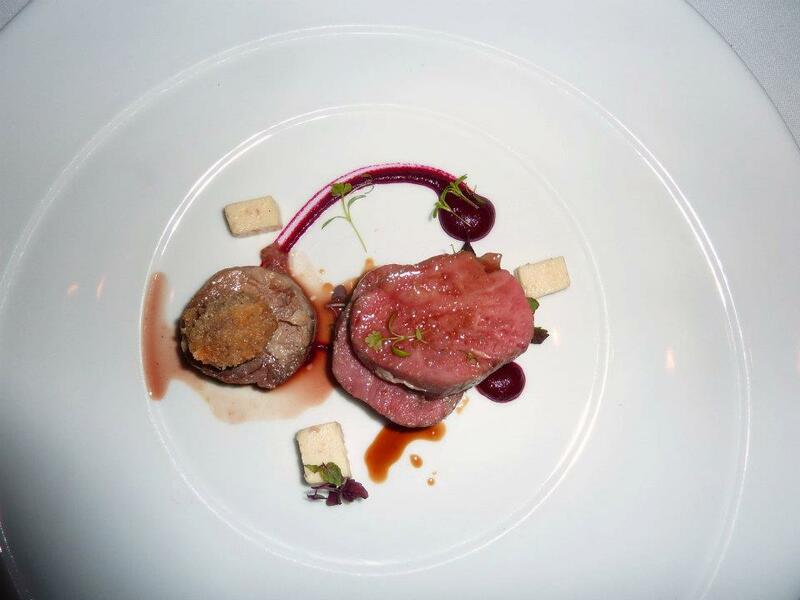 The beef was wonderfully pink and melt in your mouth delicious, well matched with the beetroot and the crunchy crumbed bone marrow. No complaints from him! We both felt at this point that four was definitely ample on the savoury front. We were feeling comfortable with what we’d had, but knew there was still room for dessert, which was a wonderful thing. Our waitress talked us through her favourites on the dessert menu, which was very helpful and it was decided that since I hadn’t had the Death by Chocolate ($14) before that I had to try that one, while GG coloured outside the line and ordered the Carrot Cake ($14). An unexpected selection, but he was curious as to how a carrot cake would be presented as such a creative establishment. 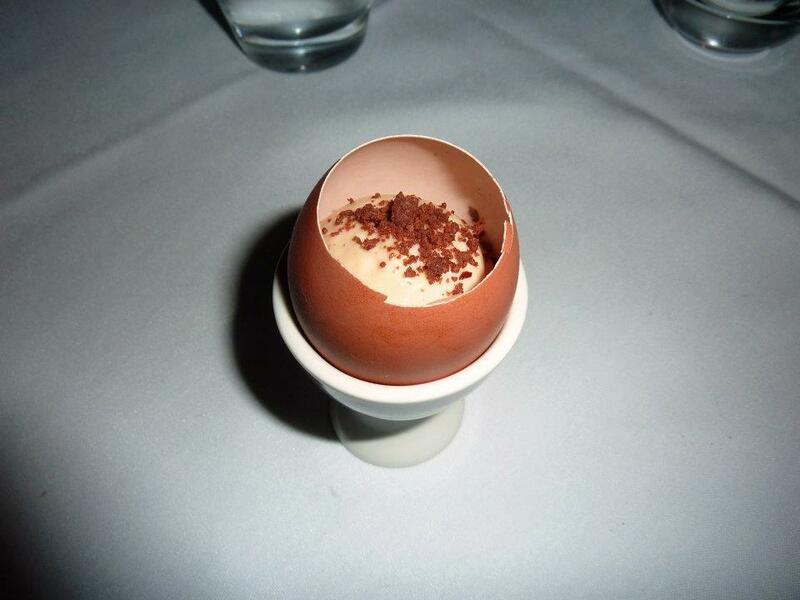 While they readied our dessert, we were brought out a pre-dessert, which came presented in an egg. I love that eggs get so much play time here. On our last visit we’d had some delicious soup served in an egg. They make a very cool dining receptacle. 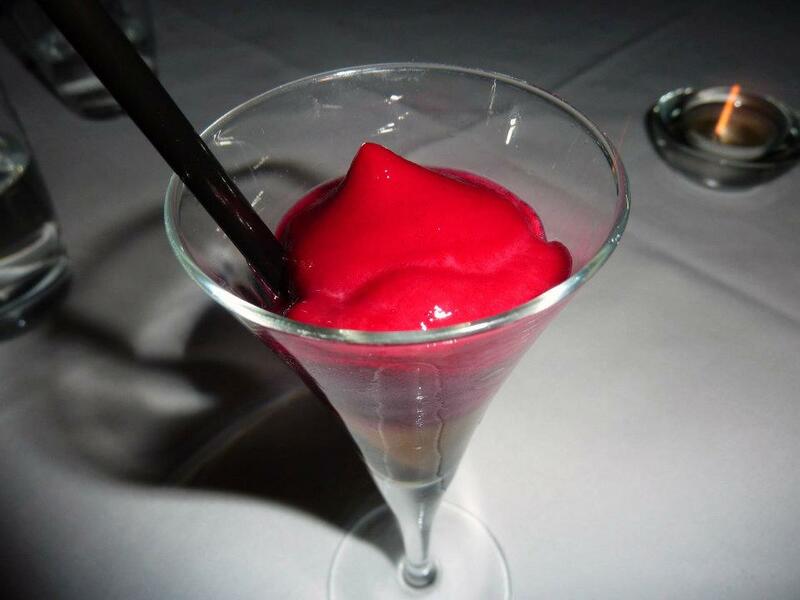 This was filled with a beautiful light mousse…. I can’t recall the flavouring, but I think it was either Baileys or Kahlua, either way it was divine. 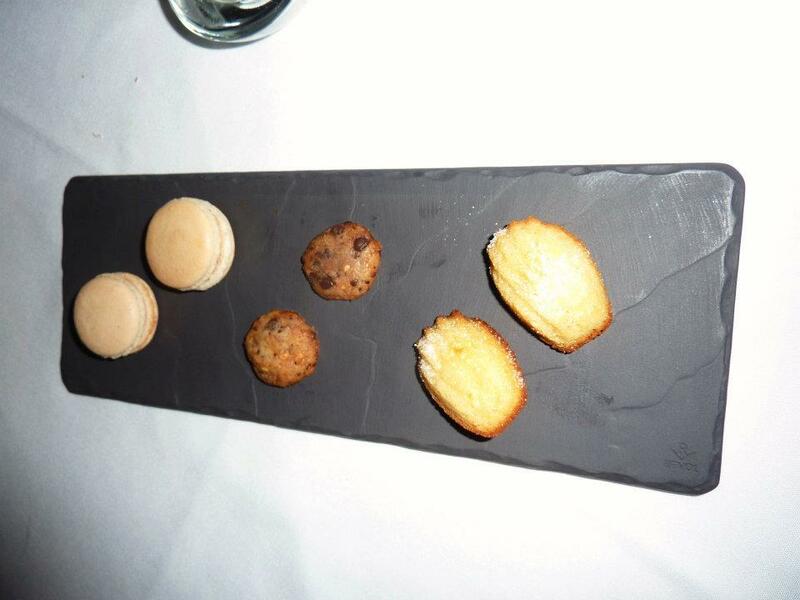 When desserts arrived I knew that if this was actually going to kill me that it would be a wonderful way to go. 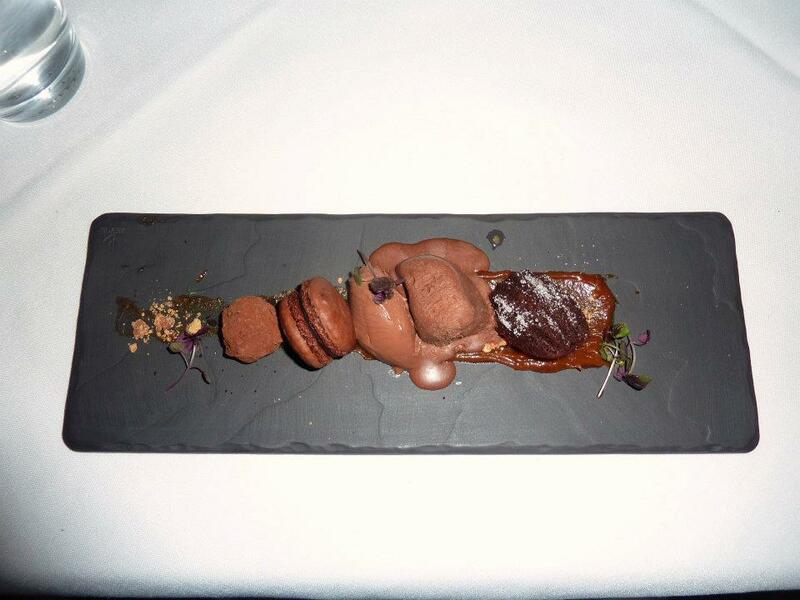 Arranged on my plate was a chocolate macaron, a bitter chocolate truffle, chocolate delice, this frozen chocolate aero mousse and a chocolate madeline. As a chocolate fan from way back, this dessert was essentially perfection to me. 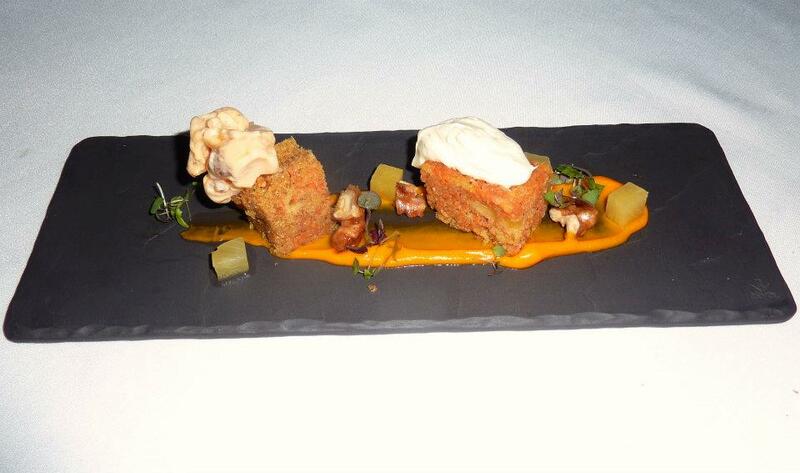 Across the table, GG looked well pleased at his deconstructed carrot cake with its flashy splash of carrot puree. On having a bite of it, it was wonderfully moist carrot cake and with a nice balance with the icing. It was at this time that we were lucky enough to get the opportunity to say hello to the man behind Petite Mort – Chef Todd Stuart. He was such a friendly fellow and it was great to get to hear how things have been going and also to thank him for his invitation to dinner. I’m glad you had such a wonderful experience, as did we on our first visit. We raved and raved So much we took foodie friends back on our 2nd visit and we were disappointed and I have emailed feedback and they have not even bothered to respond. Not one to publicly complain so I won’t go into detail, however, could not fault the food (not that we got to choose our own…which was one of my disappointments). That’s no good to hear that you had a bad experience! When you said you weren’t able to choose your own courses, was it that for certain sized groups you needed to have a set menu? I’d say give them another go. Like you said, the food is lovely. I hope third time is a charm for you! It was only a group of 6 actually. we were more coerced into having a set menu so when that happens you can hardly say no and be real prats about it. 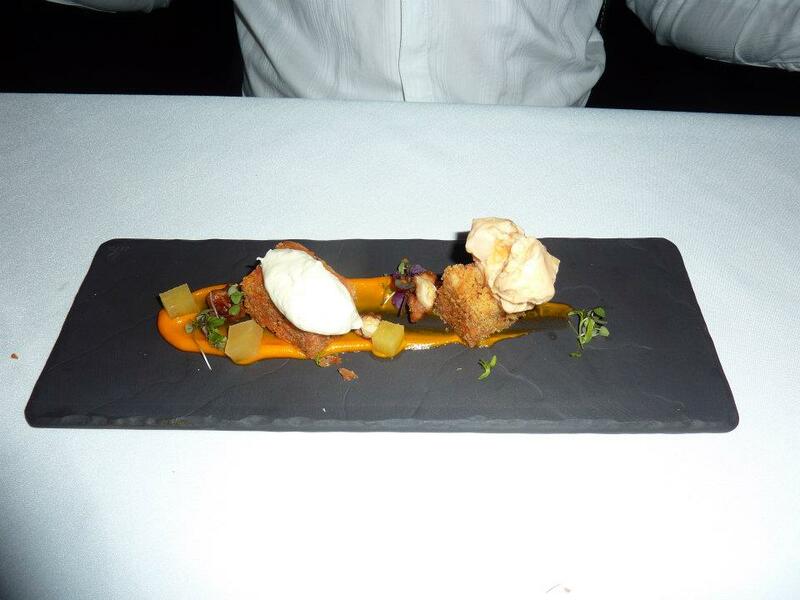 We were told “the kitchen would love us if we would go for a set menu” – so we obliged and did. Yes, maybe 3rd time lucky! I should also add that of all the courses that were delivered to our table on twice was the dish explained (we were allowed 2 different set menus and we were allowed to substitue if we didn’t eat something) so we had to try and remember which course it was….